This release about web accessibility and point of sale devices was issued as a result of a Settlement Agreement negotiated by Lainey and co-counsel Linda Dardarian using Structured Negotiations on behalf of the American Council of the Blind (ACB), the American Foundation for the Blind, and the California Council of the Blind (CCB). The full Settlement Agreement is posted in the Point of Sale Settlements Category. Blind Community Leaders Applaud RadioShack’s Commitment. Washington, DC (June 13, 2007) — In a move praised by state and national blindness organizations, RadioShack (NYSE:RSH) today announced it has undertaken a nationwide initiative to improve services for RadioShack’s customers with visual impairments. As part of the program, RadioShack will install new point of sale equipment with tactile keypads to protect the privacy and security of visually impaired shoppers and will make improvements to its Web site that will benefit visually impaired shoppers and other customers with disabilities. Todays announcement is the result of collaboration between RadioShack and major blindness organizations including the American Foundation for the Blind, American Council of the Blind, and California Council of the Blind. It is anticipated that by the end of September of this year, every RadioShack store will have the new device, which is designed to protect the financial privacy of blind and visually impaired shoppers. 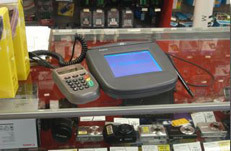 The devices, manufactured by Ingenico (www.ingenico.com), have tactile keys arranged like a standard telephone keypad and plug easily into existing point of sale payment terminals. The new units will allow RadioShack shoppers who have difficulty reading information on a touch screen to privately and independently enter their PIN, telephone number, and other confidential information. Blind community representatives praised RadioShacks plan to upgrade its point of sale devices. Point of sale devices must have tactile keys so blind people do not have to share their PIN with strangers, explained Melanie Brunson, executive director of the American Council of the Blind. Todays announcement, and the collaboration that led to it, demonstrates RadioShack’s understanding of this fact and its strong commitment to blind and visually impaired customers. Todays initiative includes RadioShacks commitment to design www.RadioShack.com in accordance with guidelines issued by the Web Accessibility Initiative (WAI) of the World Wide Web Consortium (W3C) (www.w3.org/wai). The guidelines, which do not affect the content or look and feel of a Web site, ensure that Web sites are accessible to persons with a wide range of disabilities. The guidelines are of particular benefit to blind computer users who use screen reader or magnification technology on their computers and who rely on a keyboard instead of a mouse. The program announced today is one way we can help customers who are blind or visually impaired enjoy a better shopping experience in their neighborhood RadioShack stores as well as on www.RadioShack.com and complements our on-going efforts to improve the shopping experience of all our customers with disabilities, said Frank Espinoza, vice president store operations of RadioShack Corporation. RadioShack would like to thank the American Council of the Blind, the California Council of the Blind, and the American Foundation for the Blind, for their cooperation and expertise in making RadioShack a better place to shop for our customers with disabilities. RadioShack Corporation (NYSE: RSH) is one of the nation’s most experienced and trusted consumer electronics specialty retailers. The company has a presence through more than 6,000 company-operated stores and dealer outlets in the United States, over 100 RadioShack locations in Mexico and nearly 800 wireless phone kiosks. RadioShack’s dedicated force of knowledgeable and helpful sales associates has been consistently recognized by several independent groups as providing the best customer service in the consumer electronics and wireless industries. Operating from convenient and comfortable neighborhood and mall locations, RadioShack stores deliver personalized product and service solutions within a few short minutes of where most Americans either live or work. For more information on RadioShack Corporation, or to purchase items online, visit www.radioshack.com. American Council of the Blind is a national consumer-based advocacy organization working on behalf of blind and visually impaired Americans throughout the country, with members organized through seventy state and special interest affiliates. California Council of the Blind is the California affiliate of the ACB, and is a statewide membership organization, with 40 local chapters and statewide special interest associations. ACB and CCB are dedicated to improving the quality of life, equality of opportunity and independence of all people who have visual impairments. Their members and affiliated organizations have a long history of commitment to the advancement of policies and programs which will enhance independence for people who are blind and visually impaired. More information about ACB and CCB can be found by visiting www.acb.org and www.ccbnet.org. This document is press release announcing the legal agreement signed by RadioShack with the American Council of the Blind (ACB), the American Foundation for the Blind, and the California Council of the Blind (CCB). RadioShack agreed to make changes so blind people could use payment cards and enter their own PIN. RadioShack agreed to add keys to their payment devices that a person can feel. Every store in the U.S. will have a keypad. RadioShack also agreed to make changes to its website. The changes will make it easier for people with disabilities to use the site. Lainey Feingold and Linda Dardarian were the lawyers for the blind community. No lawsuit was filed. Instead, a formal process known as Structured Negotiations was used.